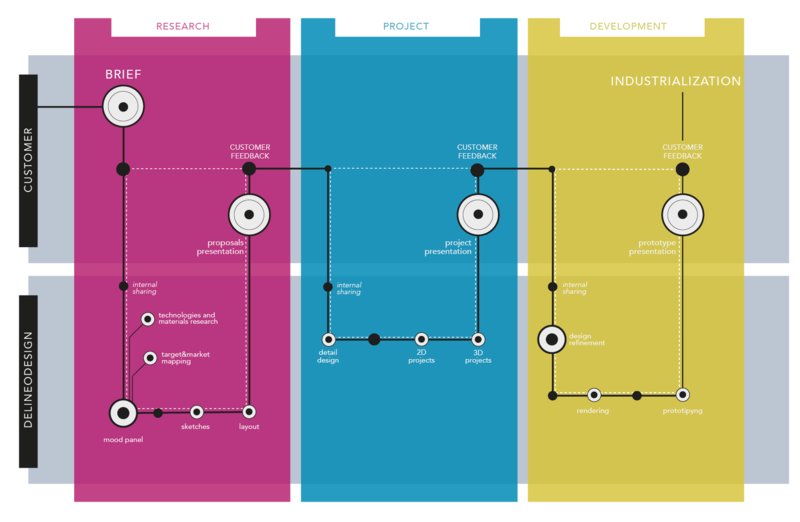 What is the starting point of industrial product design projects? Everything begins with a specific request from the client, when they find the necessity of developing a specific prodcut to enlarge the business o to take a new opportunity in the market. This is the product design. We offer an accurate industrial design consultancy and we develop our projects basing our steps on a method we have been creating in all these years of activity. It is a very detailed method and easily transferable to different market sectors, that usually need different design and technological development capabilities. The brief represents the starting point of every project. It is a moment during which the company and the designers share important information, that are the incipit of the creative process. Moodboards are at the basis of industrial design and help to efficiently communicate to the client the scenario of the concept for the development of the product. They also allow us to have a complete vision of the research we did to create the guiding idea of the project. During this phase, we conduct a careful market research (spot the trends in the sector, analysis of the target audience, technology research) and materials and production process research, in order to optimize every step of the product design project and maximize the user experience. Through a group brainstorming, we collect ideas, images, words and as consequence, a creative process get started through the first drawings and functional sketches. This first drawings express visually the guiding concept: this constitutes the basis of industrial design. After a group brainstorming, we gather ideas, images and words, and comes into play the creative intuition with the functional sketch. The first sketches are the tool to express the idea instantly and dynamically, as a visual translation of concepts and data. A very important step is the 3D design, as all the technological limits of the product development, the materials choice and the production process are taken into consideration. We pinpoint the company brand identity through the cosmesi of the product, which reflects the core values of the company and creates an emtional bond with the costumers. Prototypes are essential to see the product. The design takes place during this phase and helps to highlight any critical point and solve it before the product is manufactured. Co-engeneering relation: there is a continuous share of know-how towards a common goal. Create a product and become promoters of a new story.